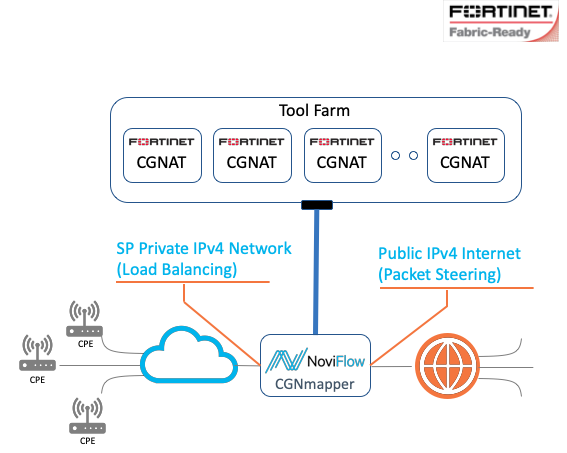 The joint solution combines NoviFlow’s CyberMapper SDN-enhanced forwarding plane with Fortinet’s FortiGate CG-NAT service, effectively incorporating this service in the SDN network. Together, the NoviFlow/Fortinet solution delivers high throughput and dynamically scalable CG-NAT services in a programmable SDN networking environment while reducing total customer network CAPEX and OPEX. The joint Fortinet/NoviFlow CG-NAT solution directly addresses the depletion of public IPv4 addresses and the highly variable nature of traffic facing large carrier and service provider networks. It also extends the radical CAPEX and OPEX benefits of SDN-based programmable forwarding planes even further into the Cybersecurity segment.